Shopping on a Sunday? Oh yes! 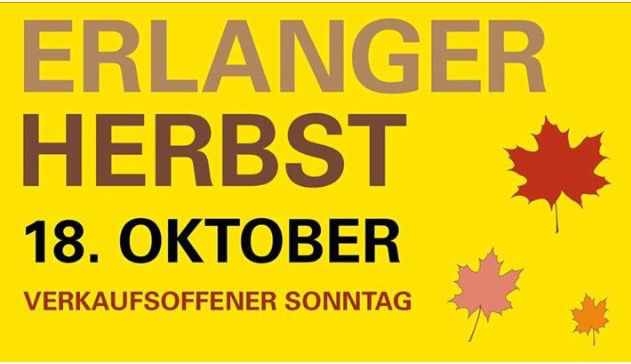 Head down to Erlangen this Sunday between 1pm-6pm for all the shopping you could ever want. Lots of shops offer special discounts and the streets will be bustling with shoppers freed from their normal Sunday activities whatever the weather. Enjoy! Not been much action on here lately has there? I promise that something exciting is happening and I hope that I can tell you about it soon. I’m also still answering all your questions via email, as best I can, don’t hesitate to get in touch if you can’t find the answer already on the blog. In 10 days time the 260th Erlanger Bergkirchweih will begin, if that isn’t something worth celebrating then I just don’t know what is! (Almost) everything you need to know is in this blog (or in the links in pink), you might also enjoy my favourite bergkirchweih related apps and websites which I’ve reviewed below. If you’re a first timer at the Bergkirchweih or just want to be prepared you might want to check out my Insiders guide, there are hints and tips on how to get there, what to wear, what to drink and what to expect generally. If you do have a question that isn’t answered there and you think it should be, feel free to get in touch. If you still haven’t bought your lederhosen or dirndl yet OR are considering not wearing one, let me convince you otherwise and direct you to the best places to buy from here. 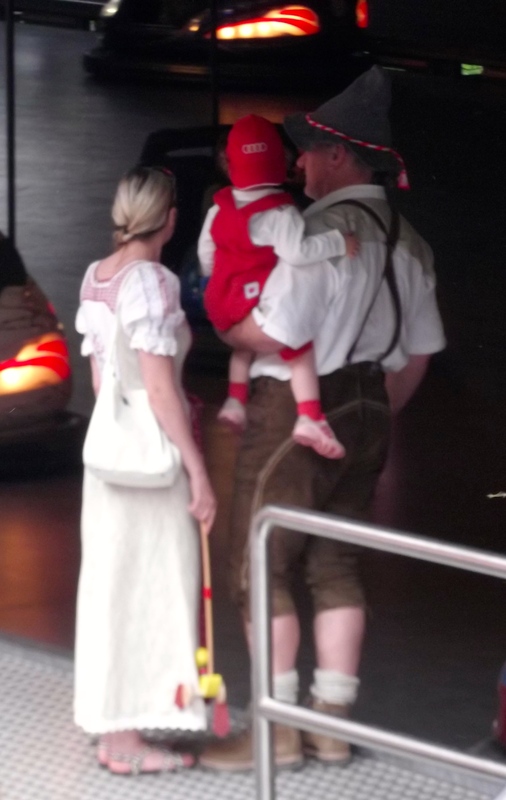 Of course it’s not compulsory to wear tracht, always wear something you’re comfortable in, whatever that is. Not drinking? You can still enjoy Bergkirchweih if you aren’t a drinker, be assured it’s not all about the beer, there is music, food and entertainment to make it a family friendly event. NB Phone and 3G signal at the Bergkirchweih can be hard to find, too many people and not enough masts, make your plan before you get there. When is a countdown app more than just a countdown app? when it contains actual useful information about music, weather and most importantly Keller locations showing which do what beers. My screenshots below. I’ve had this app for a couple of years and I love it, no need to download another next year, it automatically renews for next years bergkirchweih and I like that the bottom tabs stay visible throughout. It is in German but it has little actual text beyond Keller’s names and whether the temperature will be Prima (perfect) or not. The music tab is particularly useful so you can see which acts are going on at the same time, how long they will be on and where they’ll be. The Keller tab shows you where each Keller is, so you know where to head when you reach the T-junction. Also has a countdown function and plenty of information about what’s going on and where, you can also buy beer tokens using the app (though I have not tried this function). My screenshots below. It has an integrated Instagram stream #bergkirchweih which is a nice touch, it also has information about After-Berg events, including just how many yards it is from the Berg to the party, always helpful 😉 It is more complicated than the BerchTimer and has more visible advertising, this might be why it crashes periodically. For local travel this app is absolutely wonderful, whilst it is in German it is easy to use. You can also buy tickets through the app which work out cheaper than buying them on the day from a machine, you do have to set this up in advance, don’t attempt to do it on the go. NB If your German isn’t great the option of automatic translation of pages is a godsend, Google Chrome I love you. Otherwise I use babelFish or a good old fashioned dictionary for my translating needs. A great site which covers all your need for the Bergkirchweih. Food and drink prices, attractions and history are all there, click on the Pretzel, Maß or teddybear to open new pages, as well as the tabs. I’m so happy to see that Churros are back again this year, and the entertainingly designed Mais Men stand. The 360 degree tour is a little weird to watch but really good fun, you will find it under ‘Ansichten’. You can even download yourself a printable guide, in English here, look out for leaflets around town at places like the library, Thalia or the bank. The mountain calls, again this covers all you need to know about bergkirchweih but additionally has many candid pictures for years past and present. There is actually some fantastic information here and a lot of good details about transportation, history and even nearby eateries to try. The pictures under ‘Der Berg im Wandel der zeit’ are truly something to see, so you can compare and contrast what you see when you visit to what it was like at the very 1st bergkirchweih. Let’s all cross our fingers or press our thumbs for good weather this bergkirchweih season. You can definitely expect a few more blogs before it’s over. So, are you going? So I know a lot of readers of the blog have kids, I’ve had a fair few emails regarding the kid friendliness of beer festivals in Germany. The concerns of suitability for pushchairs, loud music, drunk people, availability of shade and appropriateness of taking your kid to a bier festival have all popped up one way or another. As have the questions from non drinkers (and non beer drinkers), are there non alcoholic drinks available? is it ok NOT to drink beer? Festivals in Germany are generally regarded as family friendly, even Oktoberfest! And whilst your little darlings won’t be sampling the beer they can still enjoy a new tradition, it’s kind of like going to a fair. Kids in tracht are adorable, buy them a gingerbread heart, some roasted almonds, some candy floss and they’ll be sugared up for pellet guns, duck hooking and the carousel. Most festival will have family days, there will be plenty of people with pushchairs and kids everywhere then. 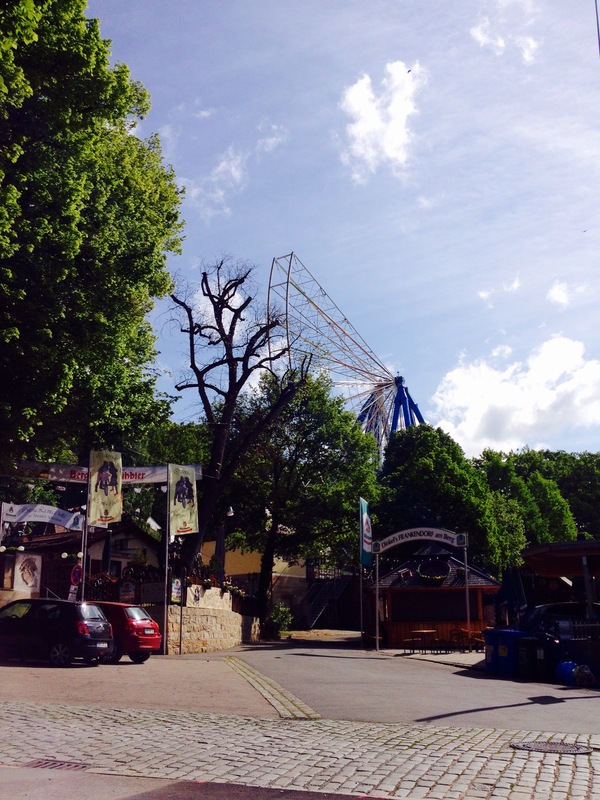 During this time the rides may be discounted and there may be special offers on. The rides themselves can range from pony rides to vintage swings to massive modern theme park type rides. There is usually a ferris wheel, always my favourite and safe, although it may not be as new fangled as some in your home country. Both the Bergkirchweih and Annafest are located in wooded areas and so have plenty of available shade, events in towns like Marktplatzfest-Erlangen, will have parasols available but make sure to slap on that suncream because queueing for food can take time! Most events will have a sound system but most are not so small that you have to be very near it, if you want to be there all day enjoying the music close up maybe ear protection for a little ones might be an idea. Whilst children are welcome at beer festivals, the atmosphere after 6 or 7pm is different and more adult and can get crowded. Whilst babies or little ones can be carried and entertained, older kids would probably be bored. Bringing snacks and drinks with you for your kids is not frowned upon, though finding somewhere to heat up baby food may be a challenge. People get drunk at beer festivals whatever the time of day is, it’s the same the world over. It is fairly easy to find a quieter area at a beer fest where you are more likely to have a family friendly experience. The legal age for purchasing beer (and wine) in Germany is 16, the legal age for spirits is 18 (though at 14 a child is allowed to with the permission and in the presence of a legal guardian). Most bier festivals will also have some wine options, don’t expect a wide selection and do be aware that you might get a half litre of wine. A weinschorle (a spritzer) is usually a good option, Suß (sweet) with lemonade or sauer (sour) with sparkling water, although you may not get a choice. You can go to a beer festival and not drink beer, it’s not a big deal. Your non alcoholic options will generally be sparkling, so water, Apfelschorle, coke etc non sparkling options can be more limited. Non alcoholic Weizen (wheat beer) is available more readily than it’s non wheaty non alcoholic rival, you will pay the same for this as you will for the alcoholic version but most brands taste just as good if not better in non alcoholic form, Maisels, Paulaner and Schneider are my personal favourites. And to the lovely pregnant lady who emailed me concerned that she would look out of place, I’m sure you aren’t the only one who has worried about this. I’ve seen pregnant ladies dancing on tables before now and in my experience there are plenty of heaving busts on view anyway to provide a decent distraction and the atmosphere is generally friendly and relaxed, always have a buddy to help you down off that table, and that’s my advice to anyone at a beer fest it’s just more fun that way. Also toilets (for pregnant ladies, parents, kids, everyone!) at festivals will usually set you back 50cents a go (kids usually go free), I don’t mind paying for a toilet that is clean, ever, and some beer festivals I’ve been to have had the cleanest toilets, much cleaner than some restaurants. As with every toilet ever, the ladies lines can be long, always go before you’re desperate. 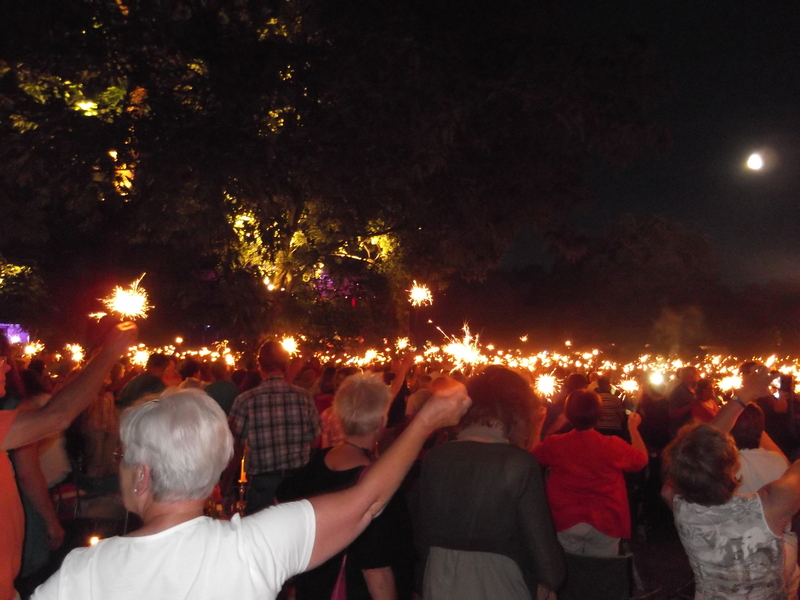 Check out my Insiders guides to Bergkirchweih and Annafest for more event specific pointers. 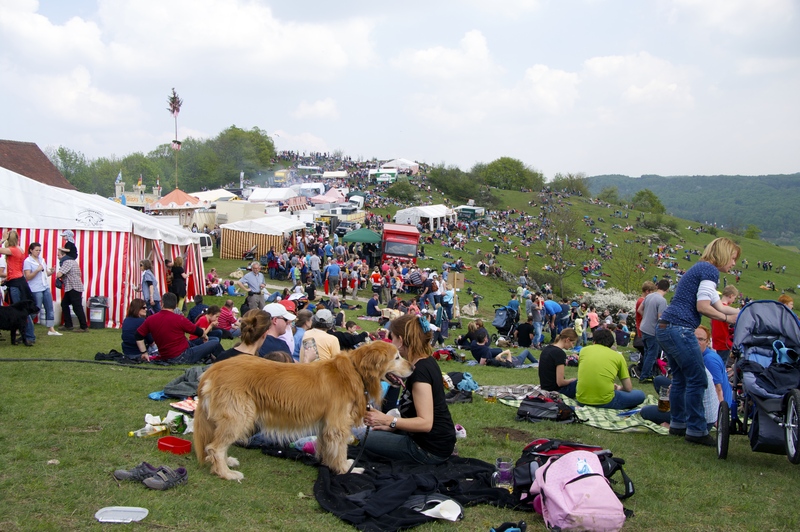 On the first weekend in May the surprisingly positioned and oldest spring festival takes place in the Fränkische Schweiz, combining wonderful beer with some of the best views in the area. Walderlafest is something to be experienced. Walberla is one of the double peaked hills of the the Ehrenbürg (the other is called Rodenstein and whilst similarly lovely doesn’t have it’s own beer festival) which are located in Upper Franconia, about 10km from Forchheim. The site has some serious history behind it and there has been archaeological evidence of settlement as far back as the Bronze Age with celtic fortifications still visible today. The festival itself can be dated back to the 9th century and is celebrated yearly on the first weekend in May and it is now a pilgrimage made by both locals and tourists alike. You’ll be surprised with what you find on the top of the hill, I promise. Check out my pictures here. By train – Head for the small village of Kirchehrenbach, if you are travelling from Erlangen/Nürnberg you will most likely have to change trains in Forchheim, from other directions you may change in Ebermannstadt, both trains will take around 10 minutes. These trains generally only run once an hour so be prepared for crowded trains from Forchheim/Ebermannstadt if you are travelling later in the day or travel earlier to avoid the crowds. By bike – Places to park a bike are easier to find than for a car, just do us all a favour and leave you bike at the bottom of the hill. By car – There is no official parking for the event so go early to find a legal space. Kirchehrenbach is a small village and doesn’t have very much parking. Important – However you travel to Walberlafest you can’t get away from the walk to the top (don’t worry that’s where they keep the beer). The walk itself is only about 3km some of it is quite steep (particularly the last 500 metres or so) and whilst most of the paths are in good condition, depending on the weather some parts can be a little rough (that last 500 metres or so again). The event is on a hill in the countryside, there is limited shelter so you are very much at the mercy of the elements, plan accordingly. Take suncream and a waterproof, hey a coat doubles as something to sit on and it’s a long way down in the rain without one. Sensible footwear, you can’t get out of the walk up there (it’s totally worth it) but to ensure your feet are happy wear some practical comfortable flats, you don’t have to have hiking boots, a decent pair of trainers or pumps will be just as good. Whilst I’ve seen tracht at Walberlafest it’s not hugely popular, maybe a day to leave it at home. The location is a protected natural landscape, always keep to the marked trails and dogs must be kept on leads at all times. Take money, there is a Sparkasse in Kirchehrenbach but not on the hill (and it’s a long way down), get your cash before you set off. As with most beer festivals it is family friendly but some of the ground can be uneven and rocky, plan accordingly. Take a picnic, food is your regular festival stuff, lots of chips and sausages, take your own if you want something different. Take a blanket to sit on, festival seating is limited so go prepared. Try the Schwarze Anna from the Neder Brauerei, it’s a Schwarz beer (obviously) and looks like Guinness but tastes much much lighter, it’s one of my all time favourites. If Schwarz beer isn’t your thing head on over to the Eichhorn Brauerei or the Brauerei Greif because they both do wonderful Hell beers, which also make delicious Radlers. Take a bottle of water for the walk up, a lot of it is in direct sun and if it’s hot you’ll be glad of a drink half way up. There are two paths up, a steeper incline and a gentler path, both merge near the top anyway but the gentler path is wider and more suitable for pushchairs and has better views for photographers. Both are marked and/or obvious. The fest begins with the raising of the May tree at 5pm Friday 1st May 2015 and the first barrel is tapped later at 6pm. Officially the fest opening hours are 10am-11pm Saturday 2nd and Sunday 3rd May 2015. There is a church service held at the chapel on Walberla 9am Sunday 3rd May 2015. Whilst Kirchehrenbach is the closest station many people choose to park in nearby villages and walk the additional distance, the surrounding area is pretty flat so on a nice day that’s definitely an option, the choice is yours. Have you heard of Walberla? Walberla has the history, all of it. They’ve dug up Bronze Age artefacts there, the work of the Celts is still very visible and the May celebration (that we now call Walberlafest) dates back to the 9th century. Add to that the amazing natural beauty of the place, stunning views and the marvellous cardio workout you get making your way to the top and you should be able to understand why this place is one of my happy places. Walberlafest has all that, and beer. Possibly my most happy of happy places. And since I’m not able to go this year I thought I’d share my photos with you, and maybe convince a few of you to go in my place. Walberla is easily spottable from the train station in Kirchehrenbach, follow everyone else and head for the hill. When you actually get to the top it’s a little confusing. Oh it’s just a beer festival, like any other. There is beer and food, tents and seating, arcade games and gingerbread hearts, but then it all becomes clear when you see those views. 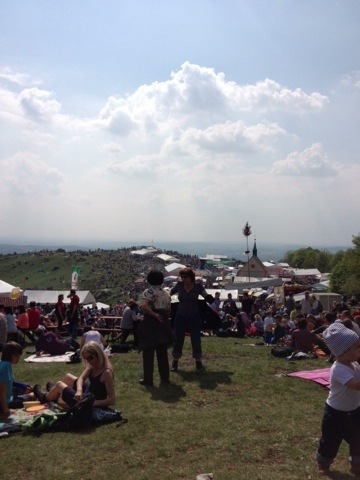 There is actually a lot of space up there on the hill for everyone to enjoy the festivities. I hope that you get chance to go and experience it for yourself, if you want the lowdown then check out my Insider’s guide. I’ll be there next year rain or shine! I have a static page of what’s coming up in the surrounding area and I’ve just realised that it hasn’t got ANY 2015 dates on and it’s already spring! Sincere apologies! To make up for it I’m giving you my personal rundown of the highlights of the outdoor season. – The night when Nürnberg turns blue and celebrates art and culture. It really has to be experienced and a lot can be enjoyed without having to buy a ticket. – Combining exercise and alcohol since, well, it’s roots can be dated back to pagan times. One of my absolute favourite days out, check out my Insiders guide. – FREE concerts on selected Sunday mornings in the Schlossgarten (Castle garden) Erlangen. The programme has not yet been released, look out for details here soon. – Shopping under the stars (until 11pm anyway) and whilst I wouldn’t necessarily recommend trying to do any shopping, it gets pretty packed, most shops and restaurants have special discounts and offers for one night only. 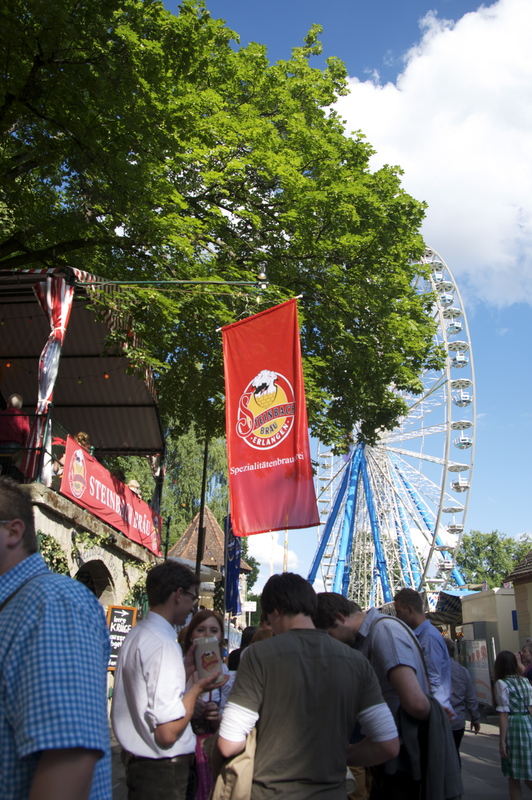 – The local bierfest on your doorstep. An experience that you won’t forget, get that tracht on and get out with your family and friends to enjoy the bier, food and atmosphere. A bierfest held in a castle moat, I mean how many times do you get the opportunity to say you’ve done that? Besides it being held in the moat it also has fab biers and food. – 10 days of celebrations at the festival ground. A lovely local festival, if you work in the area you might even score some biertickets for free biers! The town website has specifics like when the first keg is cracked, when family day is and the musical lineup. – Held in Forchheims’ Kellerwald (where the kellers are open now and will be until September time) Annafest is a bierfest with plenty of choices, food, bier, atmosphere, there really is something for everyone. – Free concerts performed by the city Philharmonic orchestra. At 11am a family friendly concert and at 8pm a different programme (of course children are welcome to stay for the evening too). Bring your picnic and get there early to stake a claim on a good plot. – Free evening concert performed by the city Symphony orchestra. 8pm start but arrive early to get a good plot and enjoy the sunshine, stay for the fireworks! – A traditional fest that sees the whole square taken up by market stalls, food and drinks and local bands keeping everyone entertained, it’s a great place to meet and while away a few hours. Look out for some more updates soon!